Description The Red Barn Studio, 212 S. Main St., will host a reception for Artist-in-Residence, Mary Hockenbery of Hotchkiss, CO, during Lindsborg’s 2nd Friday Makers Street Artwalk on Friday, February 9 from 5PM to 8PM. 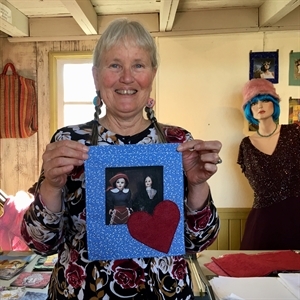 During the Artwalk, Mary Hockenbery will have a valentines making station in the studio, and using recycled paper and found object and an idea that would be suitable for a Valentine, visitors may make a valentine. Maps highlighting open downtown studios, galleries, and businesses will be available at those participating venues. Enjoy art, demonstrations, activities, refreshments and much more. The next Lindsborg’s 2nd Friday Makers Street Artwalk will be held on March 9th from 5PM to 8PM. For more information, please “Like” MAKERS STREET THE LINDSBORG ARTWALK Facebook page. Add Mary Hockenbery and the Artwalk to your free online travel itinerary.